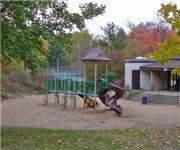 Several tennis and handball courts, ball fields, children's playground, nature area, biking and jogging paths. "Where are the Paddleball/Handball walls?" - Ray G.
How Would You Rate Manny Welder Park? Ball field, playground, basketball courts. Ice skating and children's park.